Sadly, our weekend in Nashville was coming to an end, but we are not the kind of friends to go quietly into the good night. Oh, no, we were going to squeeze one last hurrah out of this trip if it killed us. Lu had to get back home early for a family get together, so Julie, Merri and I decided to go home by way of Franklin for a little more shopping and, of course, lunch. Downtown Franklin was preparing for a beer festival later in the day, so there was lots of activity. Tents were being set up all along the streets and vendors were busy putting up tables and getting their goods ready to sell. While there was a lot of activity, because we were there before the festival began, we were actually ahead of the crowds. There are so many cute shops in Franklin, that we were kept busy for quite a while before we realized we had not eaten all day. Famished, we made our way to Puckett's Grocery right in the heart of downtown Franklin. If you remember our last trip to visit my niece in Franklin, we enjoyed dinner at Puckett's Boathouse. We really enjoyed Puckett's Boathouse, so we had high hopes for Puckett's Grocery. Puckett's Grocery opened in 2004 and was actually the second restaurant in the group of restaurants owned by Andy Marshall. The first Puckett's Grocery actually started out as a grocery store in Lieper's Fork and Marshall gradually transformed it into a restaurant and music venue with headliners like Lady Antebellum. Inside, Puckett's Grocery Franklin is crowded with tables and has that old time country grocery store feel. We had a short wait and were given a buzzer so we would know when our table was ready. Luckily, there is an open doorway from Puckett's into the next shop which happened to be a cute little dress shop, so we amused ourselves in there until our buzzer buzzed. While we looked at the menu, Merri couldn't resist the watermelon martini. It was really refreshing. Just looking at these pictures makes me hungry all over again! The Nashville hot chicken sandwich that I ordered was so good. It came with fries and coleslaw and lots of pickles. It was spicy hot, but not too hot. Merri ordered the chicken salad sandwich, but asked for it without the bread. The server was very accommodating and brought her a beautiful chicken salad plate with sweet potato fries. Merri loved it! Jules got the fried green tomato BLT, also with sweet potato fries. It was delicious as well. Julie loves cherry cobbler, so she could not resist when she saw that on the menu. It was wonderful, too. Having stuffed ourselves yet again, we were finally ready to bid Tennessee adieu and head home to Alabama. It was a wonderful weekend with great friends, lots of laughs and scrumptious food. We will be back, Nashville! 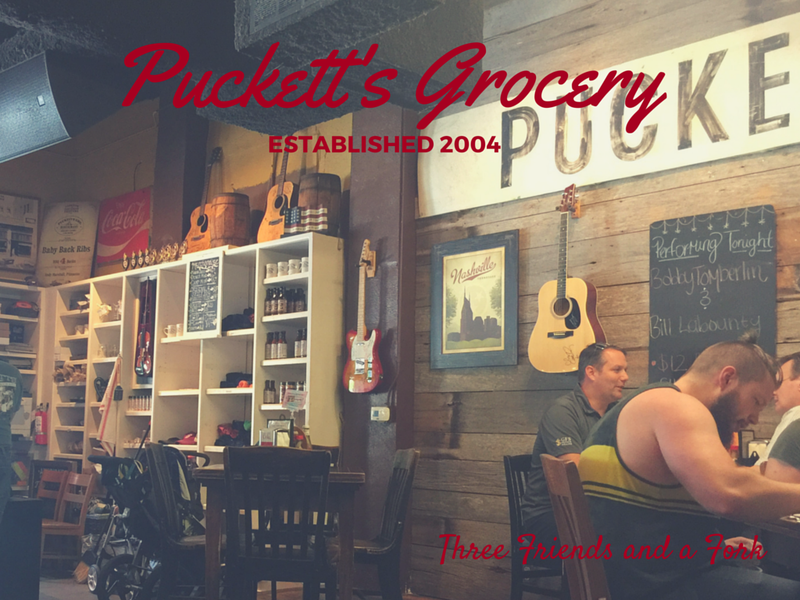 Three Friends and a Fork give Puckett's Grocery 3 Old Fashioned Yums UP!